Discover Zambia like never before and stay at the exquisite Sausage Tree Lodge camp for a magical experience. 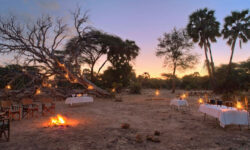 Founded in 1996 as Zambia’s most luxurious bush camps, the Sausage Tree camp has redefined the real safari experience. The camp was named after the sausage shaped fruit in the giant Sausage Trees and was rated No.1 by the BBC’s holiday program’s 10 best luxury resort of world in 2005. The Sausage Tree Lodge camp is in the natural beauty of the Lower Zambezi National Park with its abundance of wildlife. It has no boundaries and is in the heart of Lower Zambezi National Park. The animals are free to wander straight through and around the camp. 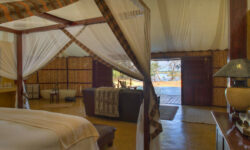 Also, the camp has 8 spacious Bedouin style tents lined along the river bank, 5 signature tents with a basic style which include Zambian teak furniture and sumptuous four poster beds. Each served with its own Muchinda (private butler). Each of the tents has open-air ensuite bathrooms. The two ‘ultra luxurious’ honeymoon suites have an in and outdoor bathroom, a large teak decking with its own private pool, mini bar, leather sofas with a spectacular view. 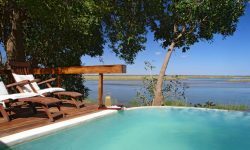 The Sausage Tree Lodge camp has a large swimming pool overlooking the mighty Zambezi River. The Kigelia House, consist of two ensuite bedrooms, a large living area, huge deck with a built in swimming pool as well as a minibar and dining table. Children of 8 years and above are welcome. Also, there is WIFI available. Here at Ubon Safari, we aim to provide our customers and clients with luxury Africa safari holidays and top of the range tour guide information. So if you’re looking for a getaway holiday to the Sausage Tree Lodge camp, choose Ubon Safari. You can email your requirements to info@ubonsafari.com. We will respond to your message as soon as possible.